SPOILER ALERT: This post may contain spoilers for fans of Mad Men who aren’t up to date with the episode that aired on May 12, 2013. So, I’ve been watching Mad Men pretty religiously since the sixth season debuted on April 7, but I have to be honest: I’m having a tough time getting into this season. There are a few things that are bugging me, but nothing more so than Don Draper‘s affair with his neighbor, Sylvia Rosen. I’m so over that storyline that every time I see Linda Cardellini onscreen now, I just sigh and roll my eyes. Thankfully, though, it seems the tryst may have finally met its long overdue death. There have been a few bright spots for me so far this season, of course: the wake for Roger‘s mother in the season premiere was one. The history nerd that I am, I’m also digging the show’s tangential nods to the events of 1968. It’s given me an opportunity to discuss that turbulent period of US history with Michel: from Tet, to the assassination of Martin Luther King, Jr., to Chicago ’68. But even though Sunday’s episode ended with the assassination of Bobby Kennedy, I found myself talking about a completely different history, a French history … the history of margarine. And like that, a post for je parle américain was born. It turns out that Peggy was absolutely right. She’s one smart cookie; that’s just another reason why she’s always been one of my favorite characters. 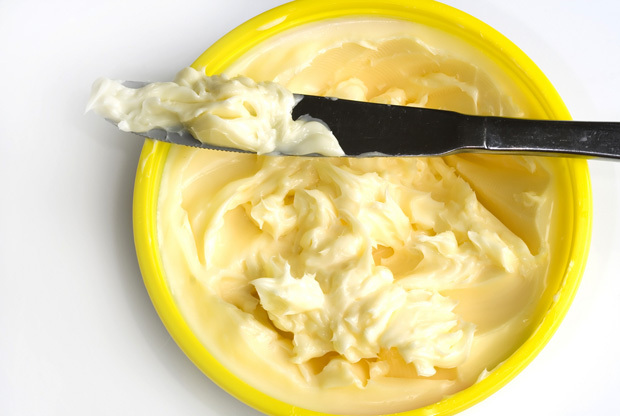 But to take it all the way back, the word “margarine” has its origins in the 1813 discovery by French chemist Michel Eugène Chevreul of “margaric acid,” which at the time was thought to be one of three fatty acids that composed most animal fats. (The name “margaric” itself comes from the Greek word for “pearl” because of the pearly deposits of this fatty acid.) It was indeed Napoléon III who subsequently initiated the quest to create a substitute for butter that could travel well with his troops and provide a cheaper alternative for the working class in newly industrialized France. Without getting into the chemistry of it all — because I’m infinitely unqualified to talk about that, and I’m far too lazy to properly investigate it — the French chemist Hippolyte Mège-Mouriès rose to the challenge, inventing “oleomargarine” by mixing beef tallow with skim milk. He patented the process in 1869 and introduced the commercial name “margarine.” He very quickly sold the patent to a Dutch company (now Unilever), though, after his invention proved to be a commercial flop. Because of beef shortages and other scientific advances over the next several decades, beef fat was eventually replaced with hydrogenated vegetable oils. By the post-WWII era, in fact, no one was using Mège-Mouriès’s recipe anymore. But they kept the name. So there you have it. Thanks to Mad Men, I now know all about the origins of margarine! And you do, too. Feel free to say that it’s thanks to je parle américain … or Peggy Olson. “I can believe it’s not butter !” Obviously he never ate butter ! I rather say : “I can believe how it’s possible to eat margarine !” yuck !